eat Schism of the Catholic Church. The Holy Roman Empire is attempting to dominate Italy and the Papacy. The Italian mercantile republics are trying to maintain their independence and influence and the Papacy is attempting to reunite the Church and stamp out heretics in France and, of course, destroy the Muslim powers and recover the Holy Land. This is all complicated by politics, family politics, dynastic politics and a coming ice age. 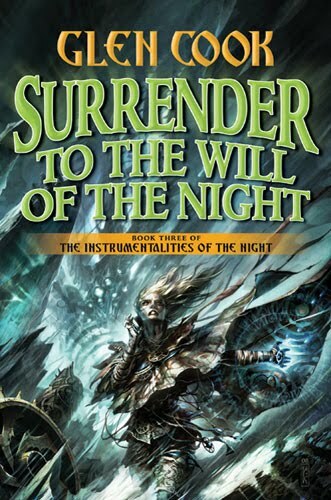 The Instrumentalities of the Night is, currently, a trilogy (The Tyranny of the Night, Lord of the Silent Kingdom and Surrender to the Will of the Night, and TBA Working the Gods’ Mischief) by Glen Cook. The story revolves around one Piper Hecht (Else Tage) in a pre-Renaissance Medieval Mediterranean world where God(s), devils and all other supernatural creatures exist, or can exist. And, as Piper has discovered, can be killed. While I might have some of these wrong, as I am now re-reading the series, I believe that it is, for the most part, correct. One must also realize that the Mother Sea (Mediterranean Sea) is land locked. The Escarp Gibr al-Tar cuts it off from Ocean (the Atlantic Ocean). The surface of the Mother Sea is several hundred feet below what we would expect. Because of this it is far less extensive than the Mediterranean Sea and the European, Asian and African coastlines extend quite a bit farther than we would otherwise expect. Hundreds, if not thousands, of cities with millions of people exist in areas our Mediterranean Sea would would cover in salt water. If you lack a background on the Mediterranean world at this time, and would like some easily readable background, you might try Will and Ariel Durant’s The Story of Civilization series. (Yes, I know there are a lot of books, I own a set, and it’s fifteen million pages long, but each volume has an index and the writing is for the layperson not a dedicated historian.) It will give you a background for all of the “history” in Instrumentalities. For the character and motivations of Sublime V and the other Patriarchs try Barbara Tuchman‘s The March of Folly (the chapter on the Renaissance popes). And all of the various nationalities and sub-groups. In terms of individuals there are dozens of characters with unusual names to learn. A half dozen storylines are active at any given moment and succeeding chapters interweave among them. None of the characters is perfect, including Brother Candle; each has his own virtues, faults and past. Their characters are reminiscent of those in the Black Company books. Moral ambiguity is everywhere; survive at all costs. There are literally scores of other major and minor characters in the story; as I get the time and inclination I’ll add to the above lists. I’ve just finished re-reading the three books and hope number four comes out before I have to re-read them again. If you find something wrong (please, page and quote for evidence) or would like to add to the above, let me know. Oh, yeah. I enjoyed The Black Company and Darkwar books. I’m waiting for A Pitiless Rain and Port of Shadows. 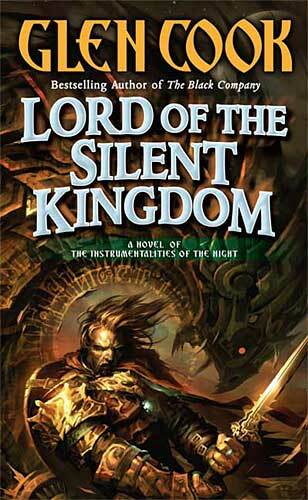 But, what I’d most like is a sequel to The Dragon Never Sleeps; hands down, this is my favorite Glen Cook book. I stumbled upon your sight in trying to find historical connections to Cook’s geographic inventions. I have everything Cook has written, and in all the years and all the blogs, emails, and conversations, etc. you are only the second person, beside myself, who has said that Dragon Never Sleeps is a favorite. What I wouldn’t give for another Kez Maefele story!